If you’re carrying a .38 Special and it is a firearm that can shoot the +P+ loadout, this is a special round for you. It is a defensive shooting powerhouse with spectacular static ballistics that translate to excellent penetration and very nice terminal ballistics. The Ranger line by Winchester offers this top performing load for those who still favor the .38 Special. Note: this is a +P+ load. That means it is a significantly overpressure loaded and exceeds standardized specifications for the caliber/cartridge. It must be shot out of firearms built to a standard that can handle these overpressures. A very impressive 1155 feet per second velocity and a stout 326 ft. lbs. of energy give new meaning to the concept of stopping power with the .38 special. These numbers are approaching top tier .40 S&W ballistics and lower tier .357 Magnum ballistics. The load is still not as heavy on recoil or muzzle snap as the .357 Magnum. The lighter weight bullet still penetrates well for the load and you can expect very nice personal protection performance in a variety of different scenarios. This is also a reloadable cartridge thanks to the brass cartridge casing and the Boxer primer. Q: is this regular .38 Special, 38 Special +P, or 38 Special +P+? 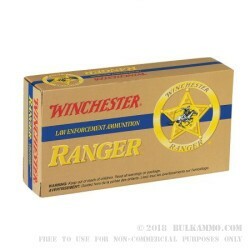 A: Winchester has classified this ammunition under the +P category. This will be safe to shoot in any 38 Special +P or 357 Magnum pistol. If shooting in a standard 38 Special pistol, I would limit the number of rounds shot to avoid any premature damage or wear to the pistol.